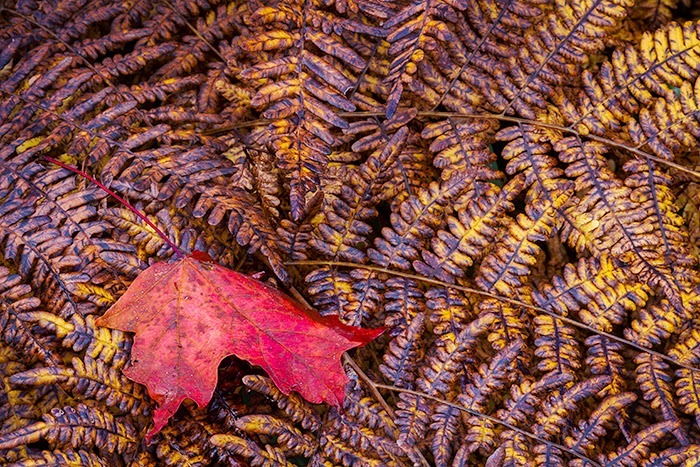 A maple leaf lies on dying ferns near the Ausable River. 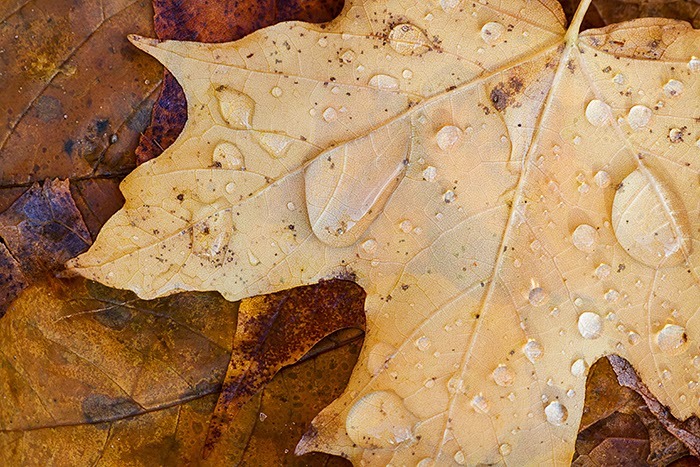 Much of the time when I'm photographing fall foliage, I tend to fall back on close-ups, macro, and isolation shots. I love the riot of fall color, but often on the East Coast, it is difficult to find a good broad wide-angle composition that doesn't get lost in the chaos a bit. I tend to want to zoom in and simplify things. On this trip I tried to get out of that fall comfort zone, most of the time I was photographing big landscapes (or at least bigger) and focusing on my night photography. But that doesn't mean I could resist a few close shots when something really popped out at me while I was moving around, or while I was waiting for fog or other weather to clear. Here are a handful of detail shots I made in the High Peaks. Enjoy! 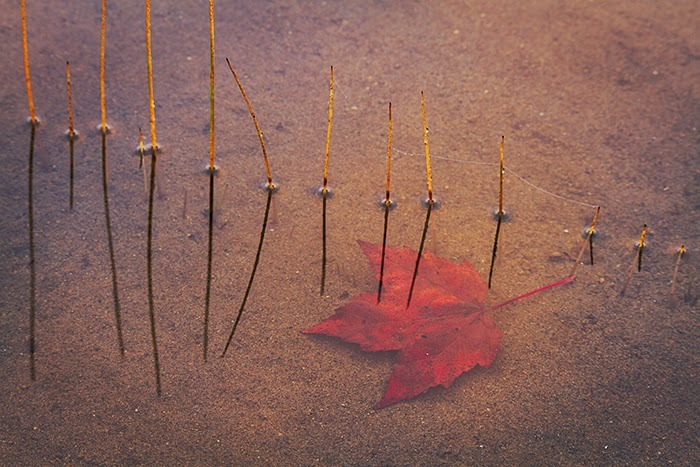 A red maple leaf under the surface of Connery Pond is lit by dramatic sunrise clouds. Leaf litter near Monument Falls on the Ausable River. 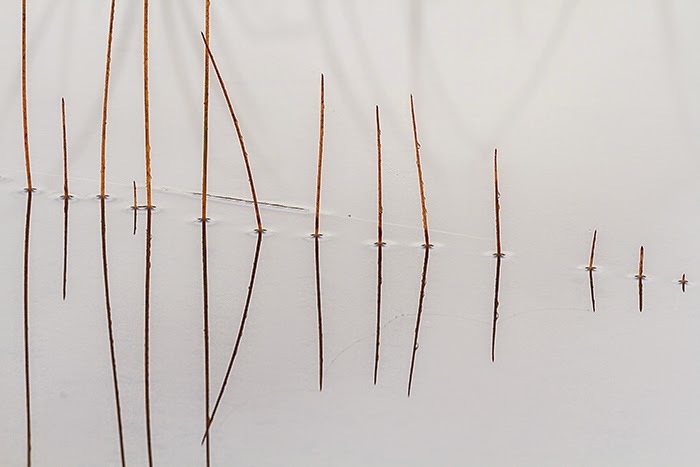 Reeds emerge from the surface of a foggy Connery Pond near Lake Placid, NY.